The Kingdom of Kerry covers some 4,750sqm of south-western Ireland and is a land of both scenic and geographical extremes. Its landscapes jump between bewildering, rocky confusions and soothing undulations in a madcap rush of rivers, mountains, and hills which include and the country’s highest peaks. The Kerry horizons have few areas that are not dominated by mountains. The coastal areas are crowded with peaks and ranges that mass together like a huge, jagged army of giants. 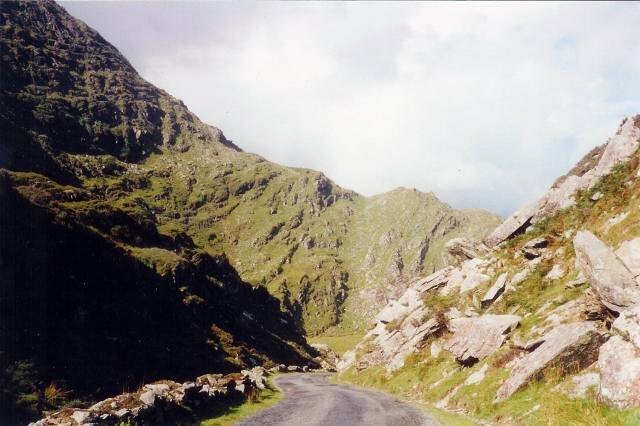 Some of Kerry`s highest mountains are to be found in and around the wild peninsulas which reach into the Atlantic. Here the Slieve Mish Mountains march to the tottering conclusion of Mount Brandon on the tip of the Dingle peninsula, the mighty sickle of Macgillycuddy’s Reeks culminates in lofty Carrauntuohill on the Iveragh. Carrauntuohill, the name of which it is said to have been derived from ‘an inverted reaping hook’ rises to a spectacular 3,400ft and is the highest peak in Ireland. Around and in-between these glorious mountains, hills, valleys and rivers are the most exhilarating scenic drives, cycle routes and walking routes you will ever experience. Do you know any spectacular drives, cycle routes or even walking routes around the county of Kerry? If you do I would love to hear about it, just email me at the link below.